Storage 120 lbs. of ice. Turbo Dispense dispenses 1/4 lbs of ice per second. 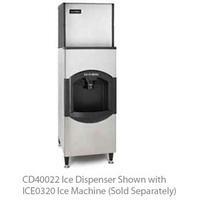 Power Clean allows access to the bin for easy cleaning without moving the ice machine. Interlock safety switch turns off machine agitation when top-front access panel is removed. 4" foam insulation for maximum ice preservation – no more quick melting ice. Great for hard water, food safety and tight spaces. view 3 year parts & labor warranty, std.